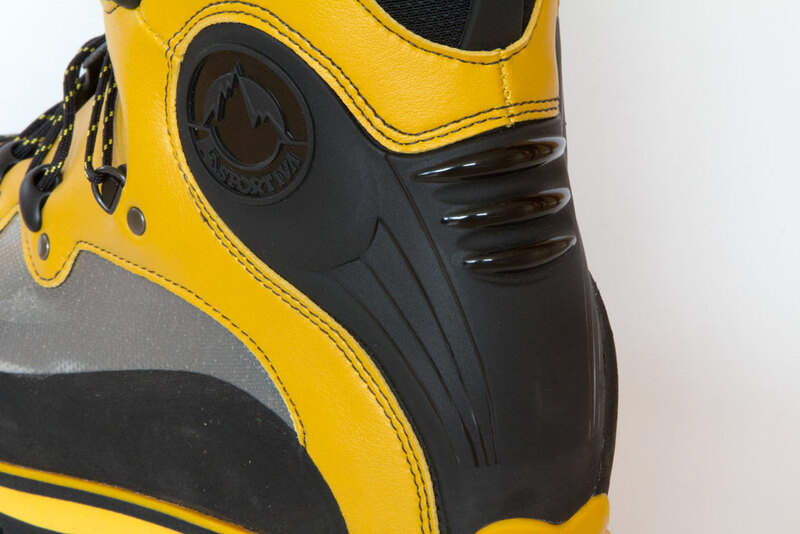 The La Sportiva Spantik is one of the very best cold weather technical climbing boots currently made. It is built with a combination of the latest technology and innovation in design features. In this review I tested its performance and took a close look at the details of the boot and how it compares to the main competitor in its category. 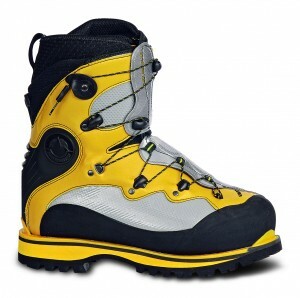 Double boots are often the best choice for high altitude and super cold weather climbing for two reasons: first, they are often warmer than single layer boots because more insulation can be put into the two layers, and second, it is generally easier to remove and dry an inner liner on a multi-day climb than it is to dry an entire boot. The problem with double boots is that added insulation can mean a loss of sensitivity on technical ground. 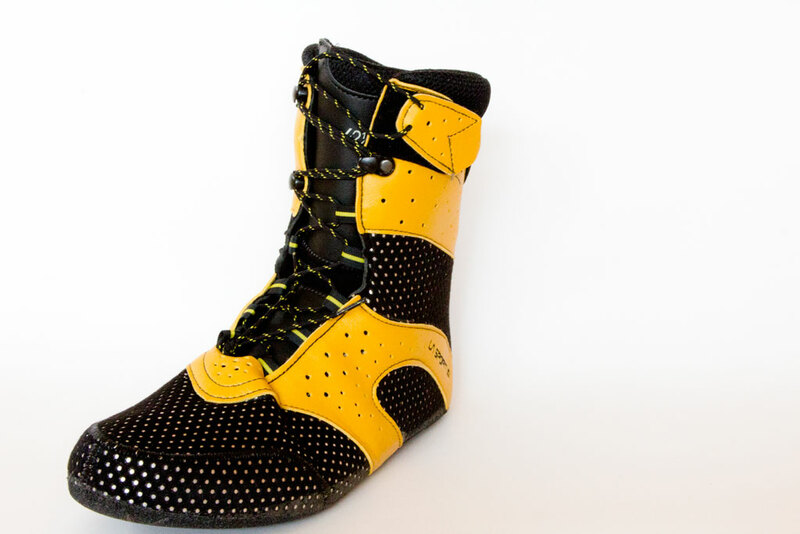 The Spantik is a boot that makes very little compromise in either direction. For a boot as rigid, warm and burly as the Spantik, they feel surprisingly light on your feet (1150g per boot), and the Spantik bears little resemblance to the clunky, heavy feel of traditional double plastic-shelled boots. This is an asset because lighter footwear generally translates into more precise boot placements, and thus better climbing. 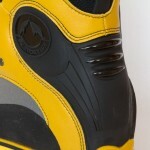 The warmth and technical climbing comfort of the Spantiks are key reasons why they dominate in their category. WI6 ice, M8 mixed, 5.10 rock? These boots can handle it. 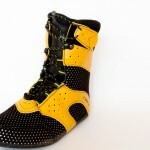 La Sportiva did a good job engineering the lacing system on the Spantik. The Spantiks are the only technical boot I have ever used that has a performance fit lacing system that can be operated with a single, gloved hand. 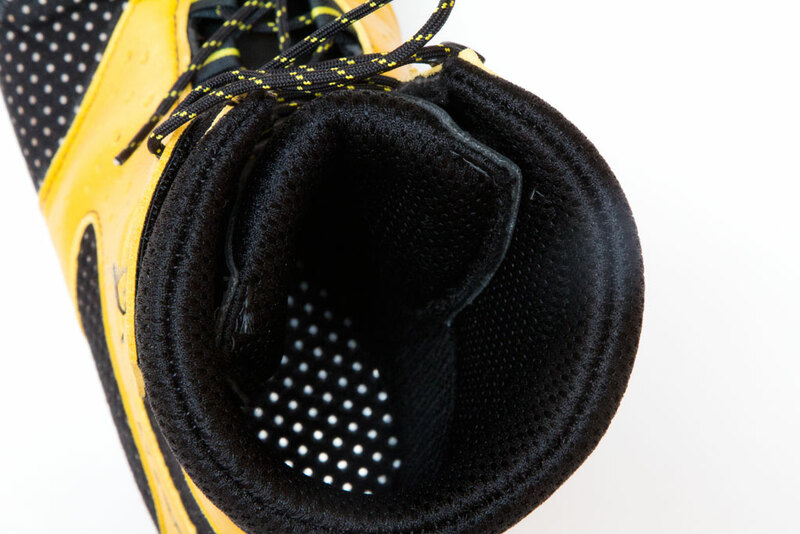 The laces of the inner boot cross back and forth to a velcro attachment, and the outer boot has a single lace that locks at the ankle and again at the top of the boot. No knot tying! Ingenious. 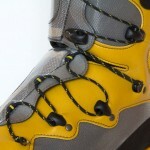 On a committing trip (especially one including rock) it would be wise to carry an extra pair of laces just in case you break one, because the provided laces are thin and potentially exposed to abrasion in spots (alternately: replace the laces with a Spectra-based cord before you go). The early versions of the Spantik had some issues with the eyelets breaking, but the current models seem to be holding up well. Getting in and out of the Spantiks is also particularly easy. Unlike boots that have exposed closed cell foam in their liners, the Spantik inner boot incorporates mesh over a thin open cell foam. This makes it possible to slide your foot into and out of the boot without removing the liner separately. At high altitude or in extreme cold, one less thing to futz with is especially welcome. Most expeditions or multi-day climbs include lengthy approaches, which can be disastrous on your feet when wearing rigid soled boots. To facilitate greater walking comfort, the Spantiks have a massive toe rocker that allows you to roll your foot forward without flexing against the sole of the boot. 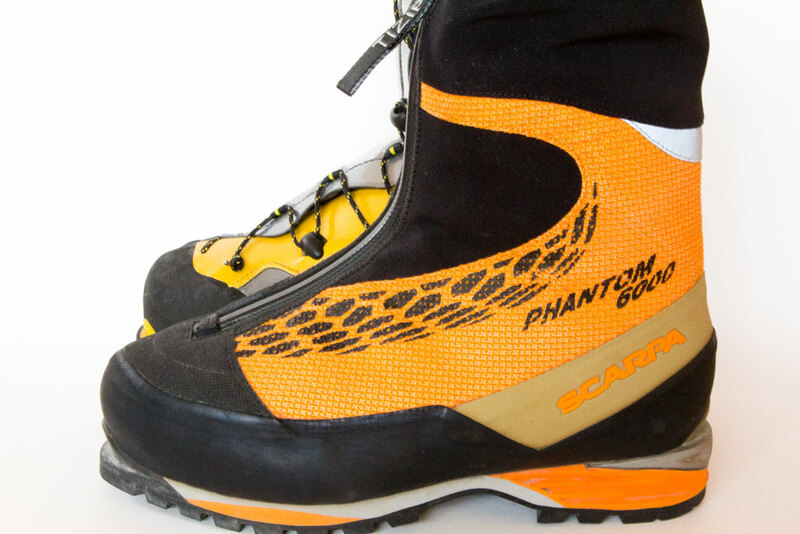 The presence of the dramatic rocker is a significant difference between the Spantik and the Spantik’s main competitor, the Scarpa Phantom 6000 (see photo). I recently walked 22 miles out from a climb over frozen snow, dry glacier, rock and trail in a boot with a rocker identical to the Phantom 6000. I rarely get blisters, but my heels were blistered on the trail section where I was fighting the rigidity of my boots. Rocker, like that on the Spantik, would have made a big difference in my hiking comfort. A disadvantage of the rocker is that it can be tricky to fit with certain models of crampons. Another difference between the soles of the Spantik and the Phantom 6000 is the thickness of the lug: the Spantik have a wide and relatively thick lug, which is great for longevity, but adds weight. The Phantom 6000s have a thinner sole, which makes them lighter, but they tend to wear more quickly, especially at the toe. 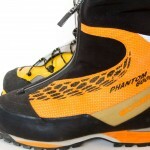 A key differentiator between the Phantom 6000 and the Spantik is the the stiffness of the upper boot. 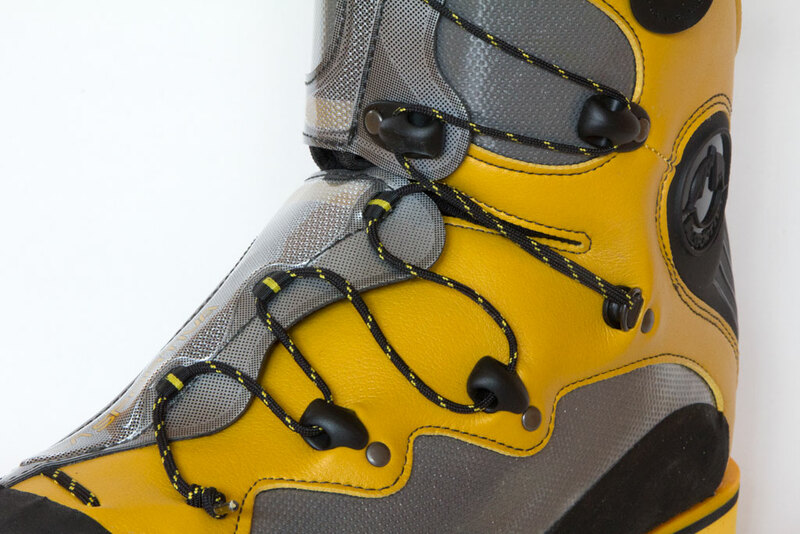 On the Spantik, the achilles area is reinforced with a hardy plastic that makes for a solid connection with crampons and Silveretta or Fritchi ski bindings. The lateral and forward flex is fairly stiff as well. This stiffness can be especially helpful with two dimensions of mountaineering: the (often humbling) experience of skiing in your climbing boots, and climbing sustained sections of hard 60 degree ice. 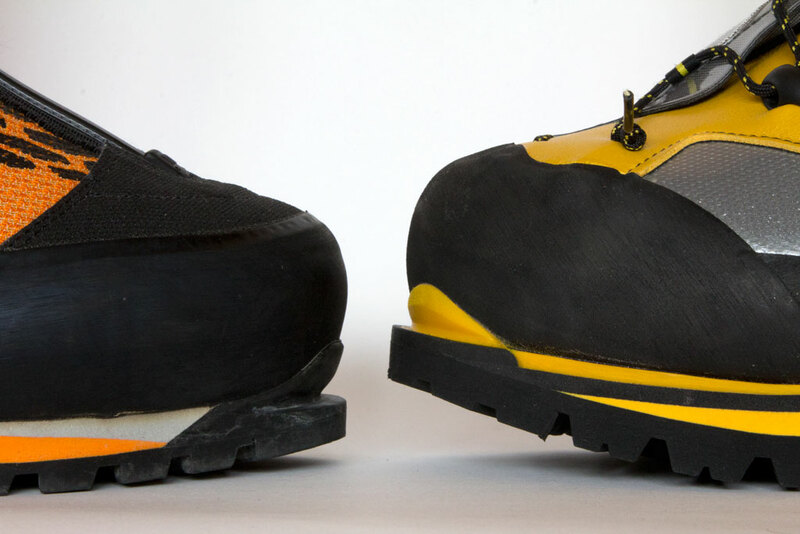 The closer your boot is to completely rigid, the easier that 60 degree ice tends to be. The drawbacks to a stiff upper boot are that it adds weight, makes it more difficult to use French technique on steep snow, and makes it difficult to achieve an extreme range of motion. While the Spantik upper is soft enough to French technique, it is not nearly as soft as the upper of the Phantom 6000s, which can easily be folded over with one hand. Depending on the type of climbing you’re going to be doing, the softness could be either a benefit or a drawback. The Spantik is unique among many double boots in that the outer shell is also insulated. The outer boot is definitely high tech, incorporating 5 layers, two of which are high density polyethylene (aka closed cell foam). Heat reflecting aluminum is also used throughout the outer and inner boots. 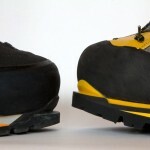 At what point should you switch from using single boots to a double boot like the Spantik? Expeditions to the Himalaya and other high altitude trips are obvious uses. But these boots climb so well, I would bring mine on cold weather trips (5F and below) and even on moderately cold routes where long ski approaches are required. The benefits of the Spantik, including increased warmth, increased comfort and the ability to easily dry, are important features that help in performing your best in the mountains. Ready to buy or just compare prices? I climb mostly in Alaska. Perhaps I am rather old school, but how would you compare the warmth of these boots compared to the Koflach Expe? Spantik is a lot warmer than the Kolflach with a foam or Intuition liners simply by the bigger volume of the Spantik. Better boot than a new pair of Kolfachs and new liners? Having used both a lot…..not imo. I just bought a pair of Spantiks and can’t see to get the outer boot tight enough. Any hints on how to actually really tighten this lacing system?